Question: Why do some people follow the basic Buddhism teachings, others follow the Mahayana, and still even more people do not agree with Buddhism at all? Ven. Khenpo Rinpoches: One of the teachings in the Mind Only school is on different types of minds. In Tibetan there is the word rig (rigs), which can be translated as “family, race, caste or gene.” In Sanskrit they call it gotra. The Mind Only school classifies different types of minds into five different categories or families. These five families are as follows: (1) the shravaka family, (2) the pratyekabuddha family, (3) the bodhisattva family, (4) the uncertain type of family, and then the category of (5) not being part of any particular family. These five families encompass every living being. Their capabilities, mentalities, and personalities all fall within these five categories. The people who are in the shravaka category are completely going to stick with the so-called “Hinayana” or shravakayana teaching even when they hear Mahayana teachings or anything other teachings. Even if you pull at them, it won’t go into their ears. Instead, it will go from one ear out the other ear. It just passes directly through them. So you cannot change someone who is in this particular family. People of the shravaka family stay within the shravaka family. The same is true for the pratyekabuddha family. No matter what circumstances or situations you create around someone in this family, whoever has this type of mind is going to strongly resist any type of change from outside of their family type. They will remain within the pratyekabuddha family. Similarly, those who are in the bodhisattva family are not going to change their habitual tendencies even if they are in the middle of the Hinayana. Their mind is completely different. They are going to have a strong tendency to retain Mahayana qualities and activities regardless of circumstances. Beings in the uncertain family are neutral. They are not predisposed to anything in particular. Whatever circumstances and situations occur will influence their minds according to that particular direction. So they are not really in a fixed category. If they become connected to the Hinayana, their mind will develop according to the Hinayana and they will follow Hinayana practices. If they are connected with the bodhisattvayana, they will gradually begin to follow the bodhisattvayana. There is no certainty of mind for this type of being. Everything is able to change pretty easily. Finally there is the category of having no family—the family of no- family. For this type of being, no matter what the situation or circumstance, he or she will not change anything. Things will just stay as they are. There will be no improvement. It will be very difficult for any kind of change to occur. This kind of individual is not going to accept any teachings or any kind of spirituality. They will not be receptive to any kind of deeper meaning. That’s it. They’re stuck and they will stay that way. These are the five different families of beings. Question: If someone doesn’t have the “gene” for spirituality (i.e., is in the category of no-family) does this continue from lifetime to lifetime? Can anything cause one type of mind to change to another type of mind? Answer: Yes, even beings in the category of no-family can change from lifetime to lifetime because they have buddha-nature. Therefore, someone who is not very receptive to spiritual teachings can change over time, but it will be very hard and is a long process. Because their mind is so obscured and they do not have many kinds of sparking, shining things within their mind already, it will take a long time to change from the no-family type of mind into a different type of mind like the bodhisattva family. Photo of Ven. 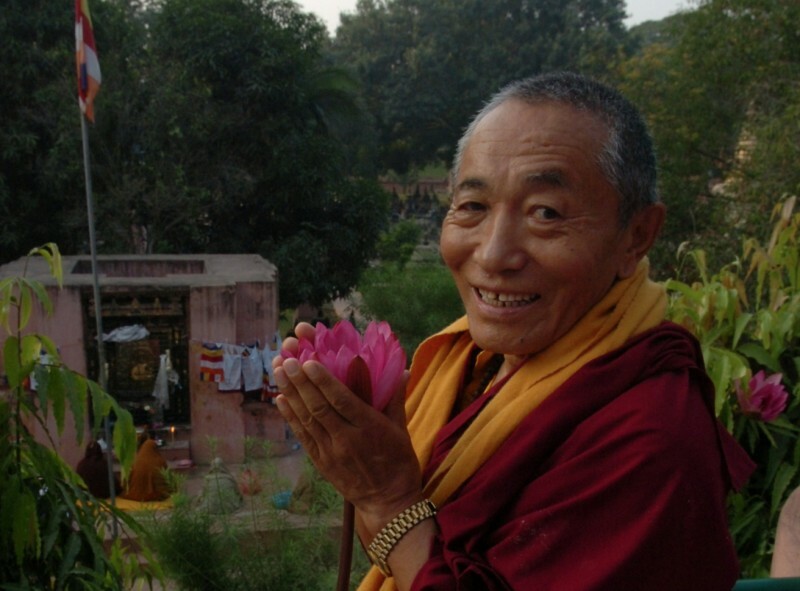 Khenchen Palden Sherab Rinpoche making offerings in Bodhgaya, India around 2006.